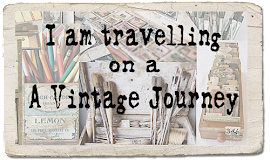 A Vintage Journey: Welcome Toni as Guest Creative Guide. Welcome Toni as Guest Creative Guide. 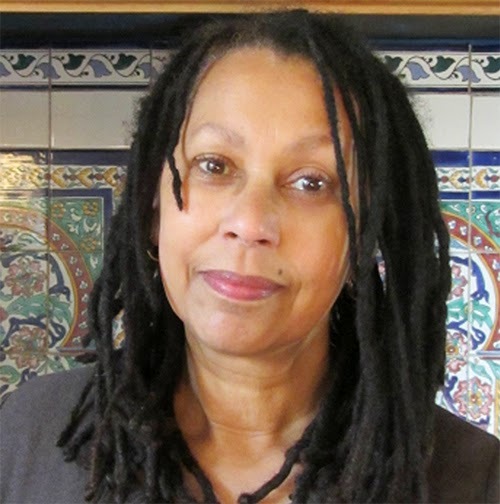 We are so lucky that very talented artists are happy to guest for us at AVJ and today we have the very lovely and gifted Toni Burrows with us. 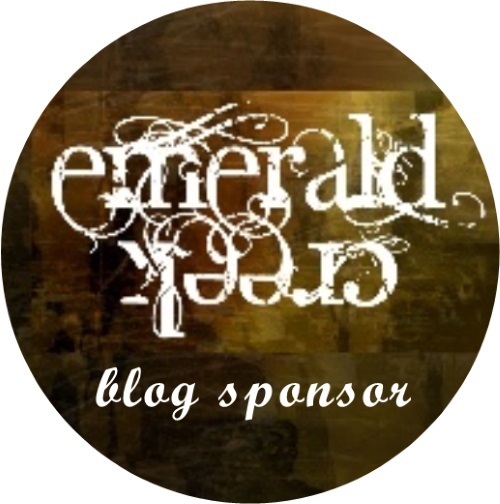 Toni resides at Artistic Craft Dabbler and I fully recommend an excursion soon if you haven't visited her part of blogland yet. She is a very artistic lady who has a love of Tim and a very unique style. Enough said from me, let's see what Toni has created for all of us today. Hi everybody! My name is Toni and I’m delighted to be a guest of the incredibly talented team here at A Vintage Journey. As a lover of all things Tim, it’s an honour to be given the opportunity to showcase a project using his fabulous products and techniques. By day I’m a teacher, I actually have two part-time jobs, one as a peripatetic Teacher for Visually Impaired Children and the second as a pottery teacher in a primary school. I live in the West Midlands with my husband and second son Max. 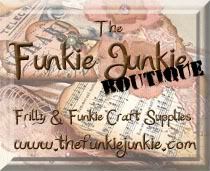 We are all lovers of vintage style and collectors of... well... pretty much anything that takes our interest. Fortunately we live in a large Victorian house and I’m lucky enough to have a big attic room to craft and stash all my stuff in! pottery, drawing and painting. One of the greatest things I learnt there was to ‘look’. 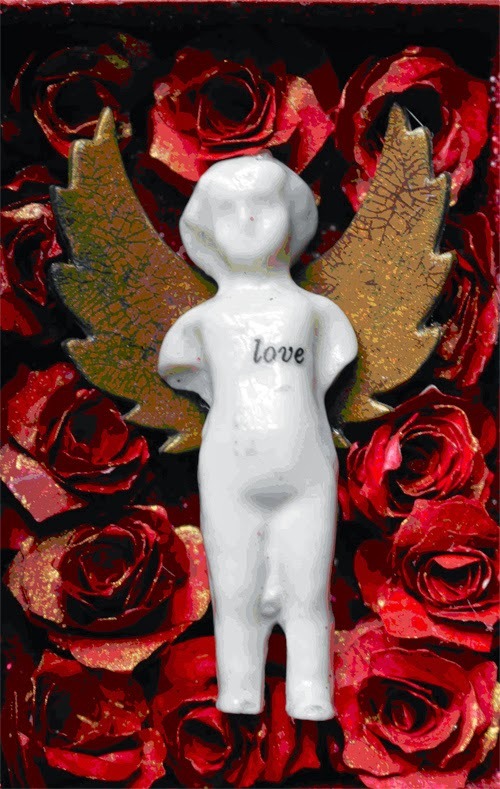 I absolutely love the theme Astrid has chosen for the current challenge, ‘Love is in the Air’ my project is a little altered a paper mache book. My initial thoughts were to make something pale and pretty but as I got started my thoughts turned towards full on romantic luxe and that of course has to include red roses. I’ve used Tim’s Tattered Pine Cone die, and included two of my all time favourite Ideaology items, an Ornate Plate and one of the original Frozen Charlotte Dolls. I covered the book with black tissue paper which I had firstly stamped and embossed with gold embossing powder. I used a strip of black fabric to cover the books spine and glued on a couple of metal numbers. I painted the inside of the book with red acrylic paint and used Rock Candy Distress Glitter, coloured with Red Pesto Alcohol ink, to coat the inside of the deeper half of the book box. I made a stamped label to fit on the other side. I then had great fun using Tim’s Tattered Pine Cone die to make lots of roses. Some were used on the cover and a dozen to go inside. I painted them red and spritzed on some gold spray once they were dry. I used the rest of the flowers to create a bed of roses for my little Frozen Charlotte to nestle into. 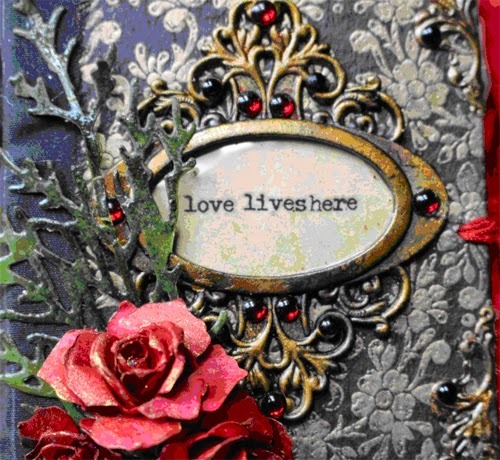 I also used Remnant Rub Ons to create the phrase under the Ornate Plate, ‘Love Lives Here’. I had to do a bit of doctoring of the words, as the words ‘here’ and ‘live’ don’t feature. I’ve had a great time creating this project and it’s been wonderful to be able to share this with you all. There are a few more details on my blog if you’d like to have a closer look. I’d like to thank the fabulous members of the AVJ Team for inviting me to travel along with them, for this part of their journey. Many thanks also to Tim for his constant innovation, encouragement and enthusiasm. And we would like to thank you too Toni for creating such a beautiful project for the current challenge. 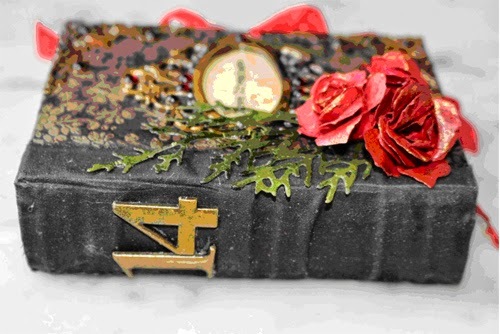 I love the idea of the book and the wonderful elements you have included, especially the bed of roses, very creative. Please pop over to see more of Toni's work on her blog and leave her a little Valentine love for such a wonderful project. If you haven't seen the challenge at AVJ yet, it runs till Thursday evening (London time) so there is still an opportunity to take part and maybe you could be winning the £10 gift voucher from Country View Crafts. Toni! so happy to see you here! 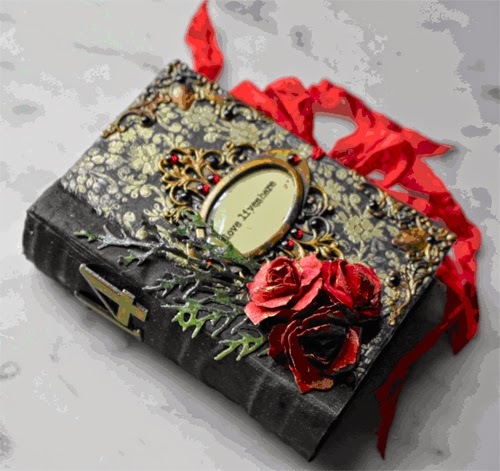 I absolutely LOVE your beautiful box - what a great technique with the black tissue, the gold embossing, the ornate frame with the red gems - and all the lovely roses inside with angel Charlotte! I've got to go back up and gaze on it again! Thanks so much for joining us at AVJ as Guest Creative Guide! Your book is totally fabulous Toni - we are so happy to have you as our guest with your lovely work. Each detail shows how much you enjoy your craft. Thanks so much for joining us and sharing your talents with us. Fantastic book Toni and so wonderful to see you here!! The outside of your book looks fantastic, but the surprise really comes when you get to see the inside, - I love how you turned the little fractured doll into an angel by giving her those crackled wings, so clever! 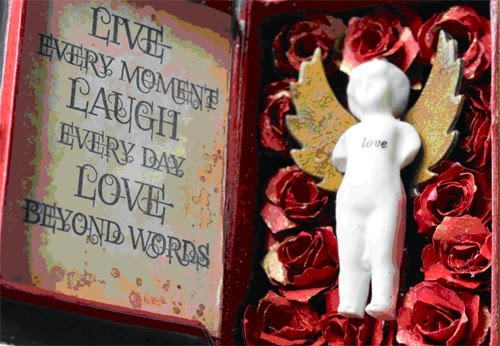 Your beautiful red roses look fantastic too, this is one beautiful Valentines box! Lovely to see your amazing work showcased here!! What a fabulous creation from Toni - brilliant to have you with us on the Vintage Journey! Toni, what a pleasure to see you as Guest Designer, and what a wonderful Valentine you have made! I always enjoy a good book, and you have made a "must read" here! I love the outside, and then, wham the contents are even better! Those roses are gorgeous! Welcome Toni. Your book is fabulous and I love the frozen Charlotte Doll in the bed of roses and the beautiful theatrical feel to this project. Stunning. Now--this wonderful creation!! I was blown away by the front alone--and then you open it and see that bed of roses with your darling Frozen Charlotte resting atop!! I Love This!! It's just amazing and the quote you chose for the inside--Perfect! A gorgeous make Toni and it's so fabulous to have you as our guest. I love your MM pieces. Destination Inspiration - Can You Feel It?